There are certain areas that are closed to anchoring, but typically we wouldn’t want to anchor there anyway. For example we aren’t allowed to anchor inside a mooring field where other people have their boats anchored permanently, but if we did we would run into other boats. Bad for them and bad for us. Other closed areas are usually sections of water that are used for specific purposes. We can’t anchor inside a fish farm (anchor stuck in nets), or too close to the Portsmouth Naval Shipyard (security, guard boats with automatic weapons). The first two change with the weather, but are the easiest to identify on a chart. 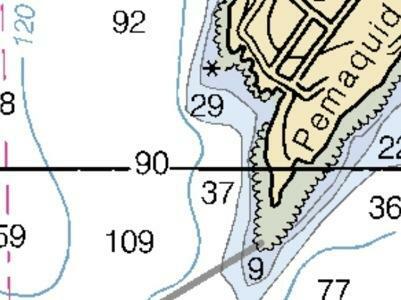 This is an example of what could potentially make a good anchorage on a chart. 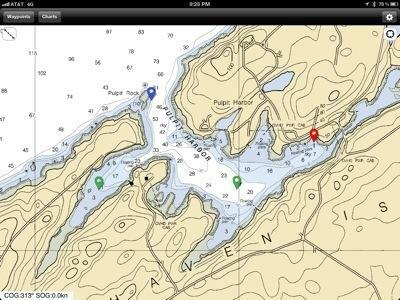 This anchorage has been recommended to us by several people including our friend Bill who taught some of our Power Squadron classes. The anchorage has land on most sides which will help to break the wind, and stop any waves from making it into the harbor. 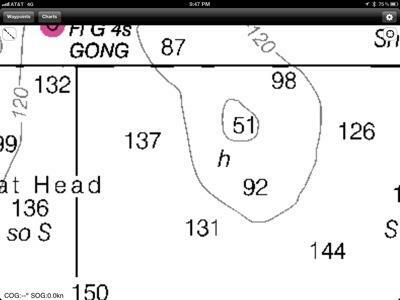 The chart also shows that there are several areas where the depth is in the 6-20 foot range (ideal for us). We could immediately rule out a place that looked like this on the chart. There really isn’t anywhere that we could tuck ourselves away out of the wind and waves, and it goes from shoreline to very deep, very quickly. 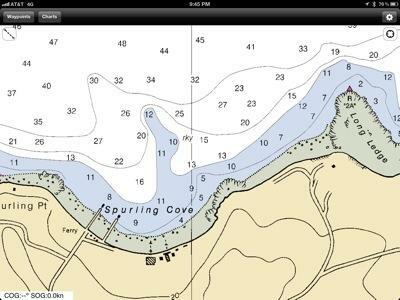 Nautical charts can also tell you what the bottom type is like. They will add a couple of letters thrown in between the depth numbers to give you an idea of what the bottom consists of. We have heard rumors of places where the bottom is made out of nice things like sand, but we haven’t seen that show up on any of our Maine charts yet. We’ll keep you posted when we start moving south. Of course charts don’t always tell the whole story, and we have several other resources at our disposal. This is conveniently kept at the front of our bookshelf within easy reach. 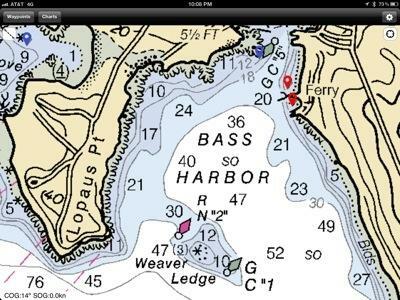 We also use the Active Captain database, which is an internet based crowd sourcing website for sailors and boaters. 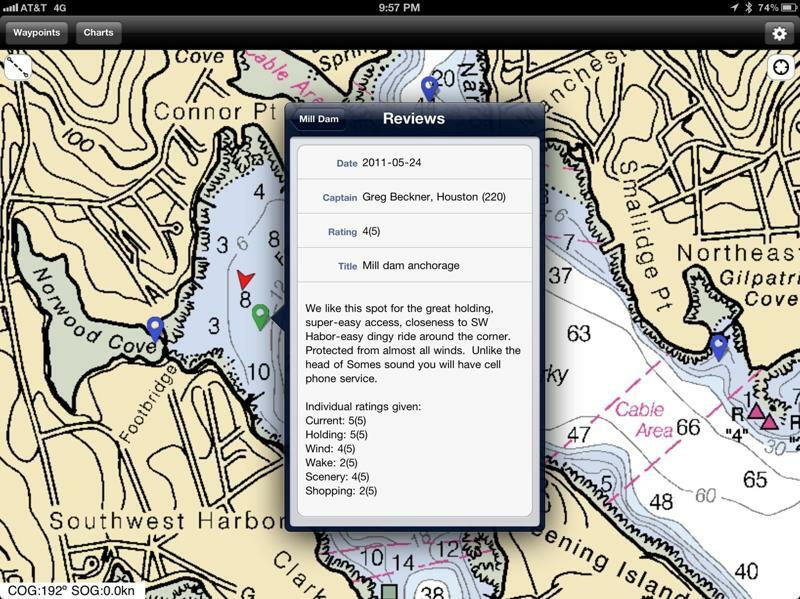 We access the data through an iPad app, and get detailed reviews of what other people thought of an anchorage before we decide to stay there. This is what the information looks like when we access it. The last reason for choosing an anchorage is why do we want to stay? Is there a great grocery store, or a neat hike? Sometimes all we are looking for is a place to stop to sleep before we move on, and then what is onshore is less important. 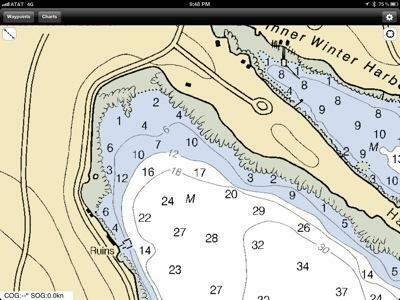 As you can see there are a lot factors that go into choosing an anchoring location. 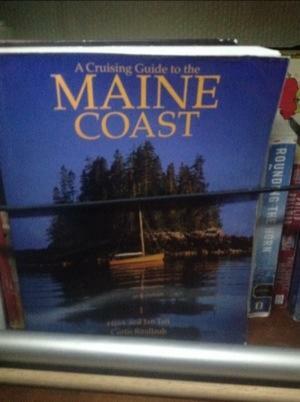 This entry was posted in Uncategorized and tagged anchoring, Inquiring Minds, navigation, safety by Brian. Bookmark the permalink. Thanks, Brian. Greatly detailed explanation with visuals. Can’t ask for more.